The Finder Darts Masters 2017 were held from December 8 till 10 in Egmond aan Zee, The Netherlands. 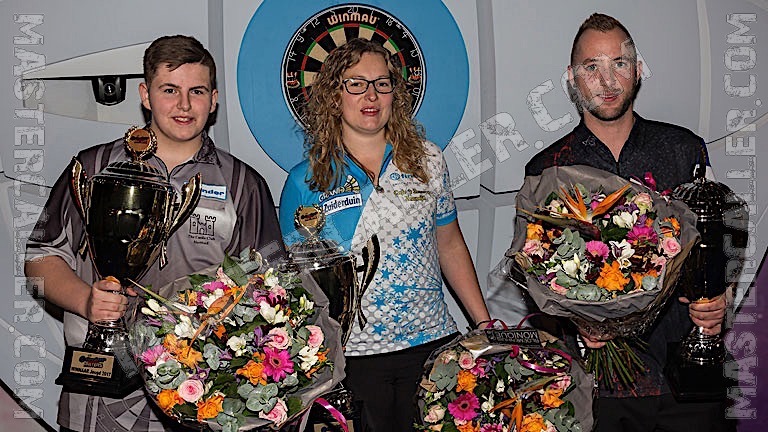 After three days of quality darts, Danny Noppert crowned himself Finder Darts Masters champion. The Dutchman was too strong for Jim Williams in an exciting final. The pair exchanged holds of throw until 3-3 in sets. Noppert won the seventh set to clinch an important break in the eight set. Eventually ‘Noppie’ claimed his title with a solid 72-checkout. Noppert, the number fifth seed in Egmond, reached the final by beating his fellow countryman Willem Mandigers (3-1) in the quarterfinal. In the semi’s the Dutch ace beat former world champion Scott Mitchell in a stunning match: 3-2. Williams faced a tough group because the Welshman had to overcome the reigning champion of the world Glen Durrant and the number two seed Geert de Vos. Especially in his second group match against Geert de Vos Williams showed his class. The Welsh ace averaged 110.58 and sent De Vos home. In the quarter- and semi-final Williams beat Scott Waites (3-2) and last year’s runner-up Jamie Hughes (3-2).